Fall Yard Tree Giveaways!Treephilly Fall Yard Tree Giveaways! The time has come TreeHuggers, the Fall 2014 Yard Tree Giveaways are here! 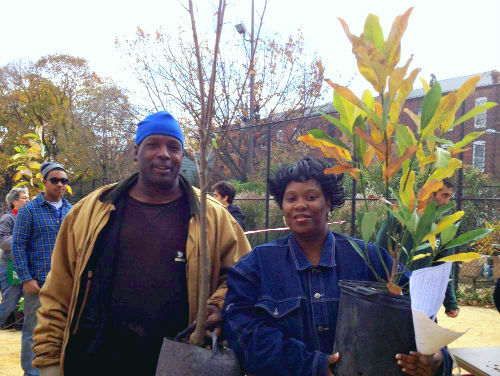 TreePhilly is happy to offer free yard trees to Philadelphia residents for another season. In partnership with the Fairmount Park Conservancy and Wells Fargo, we will be giving away 1,500 yard trees to Philadelphia residents at 4 giveaway events all across the city. At each event there will be tree planting and care demonstrations and free mulch for you to take home with your tree. AND new this year, you get to choose your tree when you register! So head over to the registration page now, or read up on the available trees here first. Just a reminder, these trees are for Philadelphia properties only, and must be planted in the ground, not in the sidewalk or in a container. Registration is open from September 2-30, and the giveaway events are October 11-2, and 18-19. Register here for your free tree! Need help choosing you tree? Stay tuned later this month for TreeHarmony, an online quiz that will help match you up with your SoulTree!